When your outdoor event includes feeding a big group, you need a big charcoal grill. The Pilot Rock Model P-1000 grill includes: twin 500-square-inch multi-level cooking grates, full bi-directional rotation, and a large side utility shelf for utensils and condiments. Heavy-gauge steel and all-welded construction create a grill that will withstand hard use and constant exposure. With the right size grill, you can keep the food hot and feed everybody. The opportunities to customize and brand your streetscape are endless with Jamestown Advanced Products' customizable bike racks. The Lakewood Bollard Bike Rack and the Kennedy Bike Rack allow two bikes to be parked per rack. The bike racks can be personalized to fit their location with the use of Jamestown Advanced Products' in-house laser. Each bike rack has the option of a surface or in-ground mount, as well as a choice of three finishes. The Galaxy recycling centers are now available in new colors and new lid options, making them perfect as a stand-alone or a complete recycling system. Recycling bins include a pull-out liner and molded-in decals to clearly identify the receptacle as part of a recycling program. Extremely durable, designed to use outdoors or indoors, the granite appearance of the lid is upscale, and the lid fits snug to the base. Hand grips allow for easy lift-off for hassle-free maintenance. Bright Idea Shops provides top-of-the-line maintenance-free signs to help hard-pressed budgets do more. Avoid the time and effort associated with the labor-intensive annual maintenance of your signs and consider something that will last a lifetime. All signs are custom-made to fit your needs and expectations. Bright Idea Shops provides everything from park or city entrance signs to small trail markers and everything in between. Belson Outdoors offers what may be the most durable, earth-friendly picnic table on earth. The picnic table is constructed with a pre-galvanized powder-coated tube frame that is made from the world's most recyclable material, steel, and comes available in tabletops and seats that are made from indefinitely recyclable aluminum. 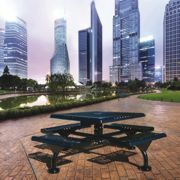 The Park Master Aluminum picnic table is available in 6-foot, 8-foot and 8-foot Universal Access lengths in Anodized, Green and Tan finishes. Its whimsical and durable interactive themed play sculptures make Cemrock playgrounds one-of-a-kind. Whether it's a giant lizard, puppy dog or life-size pirate ship, Cemrock creates high-quality, detailed pieces that no one else compares to. Everything Cemrock does is custom, so clients are free to let their imaginations soar. Imagine the play and education value possible while giving your park an identity of its own. SRP seeks to bring you a piece of craftsmanship that will last. The Webcoat brand has many options that prove to be durable, comfortable and affordable. This 46-inch Square table is available in an attached two-seat, three-seat and four-seat option, allowing for ADA accessibility. This frame option is available in three table design styles and in numerous colors. This table is available in surface-mount, in-ground mount and portable. Ease the strain of trash removal. KirbyBuilt Products' 33-gallon side-load receptacle features a convenient side-access door and a rigid plastic liner. Constructed of the finest quality recycled plastic with 36 color combinations available. Four-way trash openings allow disposal from any direction. Coordinating double recycling containers with side access doors are also available.